distribution Essentially throughout the lower elevations of the mountains, the Piedmont, and the upper Coastal Plain. Ranges east only to Halifax, Edgecombe, and Lenoir counties. Only five county records for the mountain province. abundance Rare and declining across most of the state, and likely absent from the eastern half of the Coastal Plain; certainly has declined in recent years. Most recent records are for the lower mountains and foothills. 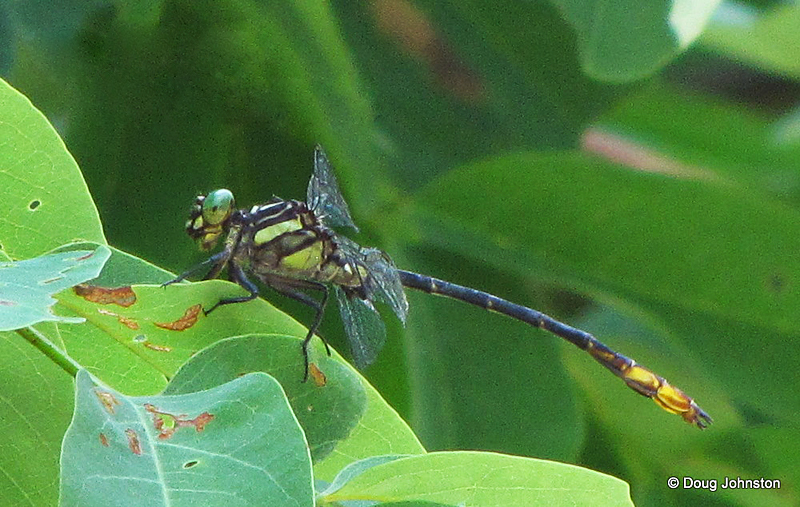 Though one of the more widespread of the stream clubtails (Stylurus species) in the state, it is quite scarce nowadays and we have a daily peak count of just 2 individuals. flight Mid-June into early October in the Piedmont. In the mountains, the flight is narrower, with records only from early August to early October. In the Coastal Plain, the few records fall between mid-June and mid-July, though it certainly occurs into the fall season there. In GA it flies from early or mid-June into September (Beaton 2007). habitat Mainly breeds at small to medium-sized creeks, where clean and with a sandy bottom. behavior Males are most often seen perched on leaves close to the water. Though they forage during the middle of the day, the species is most active late in the day. Thus, this species can often be difficult to observe because of time of day and infrequency of perching on the ground or in the open. comments Considering that Dunkle (2000) calls the species "uncommon" throughout its range, and Beaton (2007) calls it "rare and local" in its GA range, and both indicate its difficulty of observation, it is a pleasant surprise that we have slightly over 50 records with dates in the state, covering 36 counties. Even so, nearly all of these records were supplied by Duncan Cuyler in the 20th Century. It is not often encountered nowadays, and always just one or two individuals at any one site. Especially disturbing is the very few recent records from the Piedmont and Coastal Plain, suggesting a strong decline in numbers in these provinces. Its State Rank is therefore moved from S4 to now S3. And, it needs to be listed as a Watch List species by the NC Natural Heritage Program.